FORT COLLINS, Colo., April 25, 2018 /PRNewswire/ -- There was an idea to bring together a group of remarkable protective cases, so when they were needed, each device could fight the battle against drops. Ready the latest Apple and Samsung devices for action with battle-tested protection from OtterBox and the new Avengers: Infinity War Collection, available now. "For years, the Avengers have been assembling an epic team of heroes," OtterBox CEO Jim Parke said. "Fans can become part of the story with a case that protects their device against evil drops." 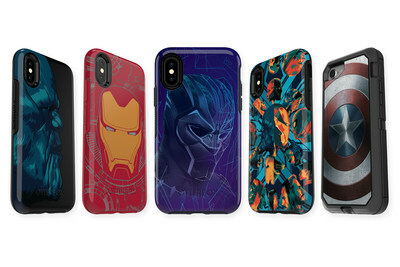 Avengers: Infinity War cases from OtterBox engage all defenses. "I Am Iron Man" Symmetry Series is all about the suit and features the first ever OtterBox glow-in-the-dark design. "Wakanda Forever" Symmetry Series combines knowledge, strength and protection, featuring Black Panther. "Thanos" Symmetry Series features matte and gloss effects that give the Super Villan a 3-D effect. "Assemble!" Symmetry Series unites the Avengers on a single device, while "Vibranium" Defender Series shields devices with time-tested glory fans expect from Captain America. Symmetry Series and Defender Series Avengers: Infinity War cases are now available at otterbox.com for iPhone 8 and iPhone 7, $44.95; iPhone 8 Plus and iPhone 7 Plus, $54.95; iPhone X, $54.95; Galaxy S9, $44.95; and Galaxy S9+, $54.95. For more information, visit otterbox.com. OtterBox is the "Official Protective Case" of Walt Disney World Resort and Disneyland Resort. 1 Symmetry Series and Defender Series are NOT protective against water. Will provide added protection against drops and shock.